In 2003, The Cedar Fire burned approximately 50 square miles on the south side of the rural community of Ramona. In 2007, The Witch Creek Fire, along with The Guejito Fire, swept over the east, north and west sides of Ramona, burning nearly 70 square miles. Lives and a substantial amount of property were lost in the two fires. Approximately 10 square miles of hilly terrain did not burn in either fire. 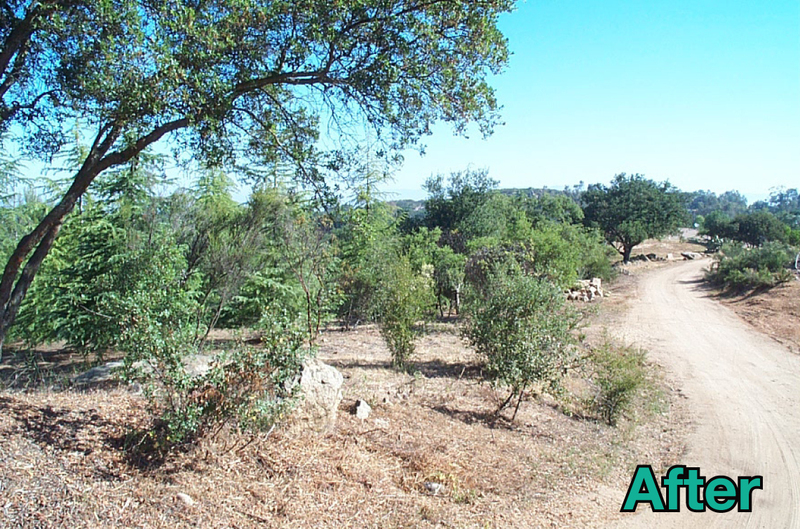 This area is located on the West End of Ramona and is covered with dense 40-year-old chaparral and oak woodland. The idea of a fire safe council was promoted in Ramona after the 2003 fires by the Fire Safe Council of San Diego County. After the fires of 2007, a neighborhood fire safe council on the West End of Ramona was formed. Working closely with the local Fire Department and CAL FIRE, priorities were established. The roads in the area were the first concern. Brush growing to the edge of the road surface made the roadways extremely hazardous for homeowners who may need to evacuate during a fire. At that time, for the safety of fire personnel, fire fighters were extremely hesitant to enter these roads during a wind driven, wildland fire, leaving these properties extremely vulnerable to any type of fire. Other priorities established were based on the greatest benefit to the greatest numbers of people. Plans were made to remove vegetation in the first 10 feet on either side of the roads according to county codes and local ordinances. It was then determined to reduce 50 percent more vegetation back from the road, creating a shaded fuel break. In areas of particularly dense vegetation near homes, defensible space projects were planned. The Ramona West End Fire Safe Council applied for and was awarded a US Forest Service grant through the California Fire Safe Council. The project concentrated on improved safety along roadways and providing defensible space. CAL FIRE planned and executed a separate community defense project known as the Ramona West End Fuel Break in a strategic area where firefighters could stage equipment during a fire, providing an added layer of protection to the area. Access to the fuel break is made possible by the improved safety along the area roads. Today, CAL FIRE and the local Fire Department deem these roads safe to drive and defend properties in the area. Although a major fire has not yet tested the effectiveness of the project, the framework has been laid for future vegetation control projects, maintenance for The Ramona West End Fuel Break, the road project and enhanced defensible space. The Ramona West End Fire Safe Council has subsequently applied for and been awarded funding for a maintenance grant to maintain the fuels on the original road and defensible space project. 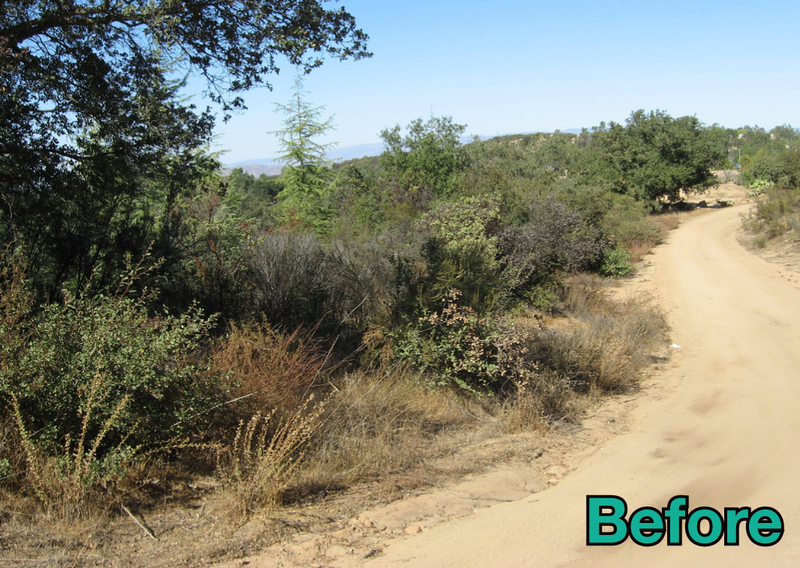 The project was also expanded to include defensible space work and fuel reduction along a new road. The Ramona West End Fire Safe Council offers a program throughout the community for people over 55 and/or with physical limitations, and with limited income who are unable to maintain their defensible space. People who meet the requirements can apply for funding. I want to thank Kristi Mansolf for taking time out of her busy schedule to personally come to my mothers house with the forms to fill out because she was concerned and cared enough about my mothers immediate need to have her place cleared. She answered all of my mothers concerns in a professional and caring way. She set my mothers fears at rest. All to many times today the elderly are just pushed aside and treated as though they have no feeling or right to respect. My mother has had several unpleasent dealing with our “public servents” They forget that it is these elderly that all of their lives have paid for the jobs and services that these people have! and if for no other reason than that should be respected. Thank you so much Kristi I wish there were more of you to go around LOL.